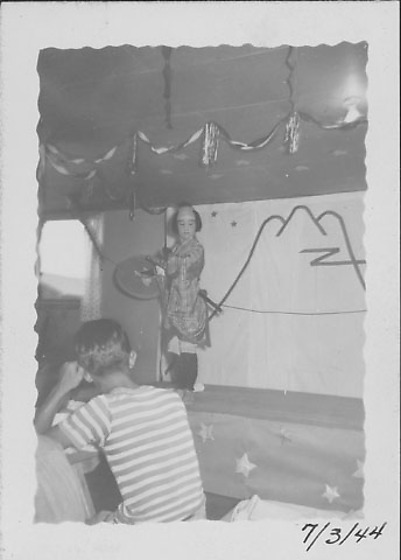 Boy in Japanese costume on stage of Kabuki performance with audience watching at Rohwer concentration camp, July 3, 1944. Single actor in tartan kimono tucked into obi, shaved head wig, sword and round hat, stands onstage in front of a stylized mountaintop backdrop. Streamers hang from ceiling and stars on base of stage. Boy in striped T-shirt sits with back to viewer in foreground left. Same boy as in 97.292.4B.